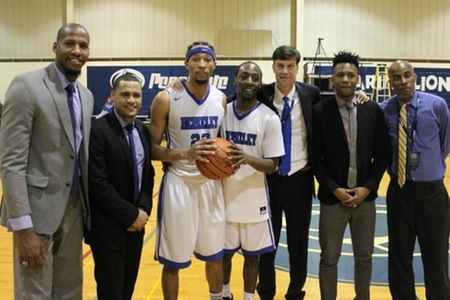 Photo Caption: All-American student-athletes Stephon Jennings of Manhattan, NY, and Massiah Merritt of Brooklyn, NY, (center, wearing white jerseys) pose with Head Coach Chris Christiansen (third from left) after the Berkeley College Men’s Basketball team’s win in the quarterfinal round of the 2017 United States Collegiate Athletic Association Division II National Men’s Basketball Championship on March 2, 2017. During the game, Mr. Jennings scored his 1,000th career point. Assistant Coaches above (left to right) include Elijah Craig, Jon Pena, Anton Dickerson, and Kenneth Ray. The Berkeley College Men’s Basketball team advanced to the semifinal round of the 2017 United States Collegiate Athletic Association (USCAA) Division II National Men’s Basketball Championship, on March 2, 2017. The Berkeley Knights defeated Villa Maria College of Buffalo, NY, during the quarterfinal game by a score of 91-64. The win marks the team’s 51st consecutive victory. The evening also marked a milestone for student-athlete Stephon Jennings of Manhattan, NY, who during the game scored his 1,000th career point. A product of A. Philip Randolph High School, Mr. Jennings’ 9.6 rebounds per contest are a team-high, and he averages 14.1 points per game. Mr. Jennings was also selected as a Second Team All-American at the USCAA Basketball National Championship Banquet on February 28, 2017. To read a play-by-play recap of the Berkeley Knights’ winning quarterfinal game by Stephen Spagnoli, Assistant Director of Athletics, click here. The team will play against Penn State Greater Allegheny of McKeesport, PA, in the semifinal round this evening, March 3, 2017, at 5:00 p.m. EST. The game can be streamed live online here. This past week, The New York Times published a story about the ongoing success of the Berkeley College Knights, highlighting what drives the players as student-athletes. Click here to read The New York Times story. To view a high resolution version of this release, click here.